Getting the most out of Google products such as Gmail, Docs, and YouTube is a must if you're using them for business. However, the products are so packed with features that it can be hard to keep up. Here are 10 little-known features across various Google services that could change the way you work, or perhaps make life that little bit easier. Until recently it was only possible to view office documents, such as Microsoft Word or Excel files, but a few weeks ago the list expanded significantly to include Adobe Photoshop and Illustrator files, TrueType fonts, AutoCad files, and even files created by Apple's iWork Pages. 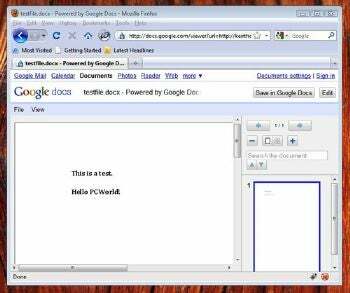 Google Docs Viewer lets you view all kinds of files online. Another feature of the Google Docs Viewer Website mentioned above is that you can create your own URLs that point to files online, and send them to others so they can instantly view the file by clicking the link. Gmail can be configured to use HTTPS always by clicking the Settings link at the top right, and then selecting Always use HTTPS under the Browser Connection heading that appears. To ensure that nobody but you ever accesses your Google account, you can have Google phone you with a confirmation code or send a SMS to your cell phone, every time you login. That way, even if somebody steals or second guesses your password, there's simply no way they can access your account. This security is known as a two-stage verification procedure, which you can set up here. Note that this service is still being rolled out and might not yet be available to you. Keep checking back, however, because the intention is for it to be available to all Google users. Gmail users can also use an @google-mail.com address. A drawback (or benefit) of the new security is that you might need to add new, specific passwords for certain Google services, such as mobile Gmail, desktop Picasa, or AdWords Editor. This is because these services don't yet work with the two-step verification process. Signing up using the link above will walk you through what's required. You might already know about Gmail aliases, which is to say, using periods or plus symbols to extend your standard Gmail address so you can filter for spam. 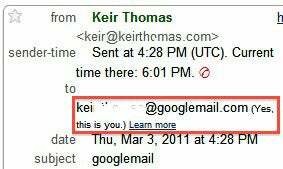 What you might not know is that you can use @google-mail.com as well as @gmail.com. In other words, if you normally use example.address@gmail.com for your e-mail, then you can also use example.address@google-mail.com , and the message will still reach you. You could use @google-mail.com when signing up to newsletters, for example, and create a filter rule within Gmail to sort any messages sent to that address into a spam folder. The @google-mail.com address came about because of trademark issues in Europe, where Gmail was already being used by rival services. Worried somebody's been snooping on your Gmail account? By clicking the Details link at the very bottom of the Gmail page, you can view when, where and how your Gmail account was last accessed. The last 10 logins are listed. Has YouTube been stuttering, or just a little slow? By right-clicking any video and selecting Take Speed Test or just visiting this speed-test link , you can compare your playback speed to others who use your ISP, as well as comparing it to the average speed for your city, and country. By clicking the Show Video Test link, you can measure your speed. Just look at the HTTP section in the information window at the top left of the video display to see how quickly you're receiving the video file. You can drag and drop files onto Gmail windows if using Chrome or Firefox. If you're using Firefox or Google Chrome to access Google's services, you can often drag and drop files onto the browser window if the Google product is one that works with files. For example, when creating a mail message, you can simply drag and drop files onto the browser window to instantly attach them (you'll need to "drop" them over the green Drop Files Here area). If creating a word processor document in Google Docs, you can drag and drop pictures into the browser window to place them on the page. This doesn't work with Internet Explorer, unfortunately. Ever tried to access one of Google's services but you've been unable to? If you're like me, the first think you'll do is ask any colleagues nearby whether they can access the service. Well, no more. By visiting the Google Apps Status page you can see at a glance whether there are any problems, and if so, what the nature of the problem is. If you're not quite ready to take the plunge into working with Google Docs through your Web browser, you can download the Google Cloud Connect plugin for Microsoft Office, which is now freely available after a long period of testing. This allows more than one person to work on a Microsoft Office file that's been uploaded to somebody's Google Docs space. Any edits made by others are instantly reflected within the document, all within the standard Microsoft Office program window, and you have the added benefit that files are stored in Google's cloud and revisions tracked.